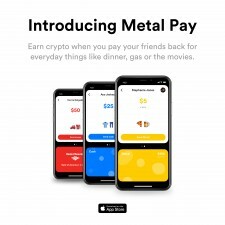 SAN FRANCISCO, September 14, 2018	(Newswire.com) - ​Metallicus Inc., a blockchain-based payment processing platform, today announced the launch of its flagship product Metal Pay. Metal Pay allows people to instantly send money to friends, family and businesses with just a phone number and rewards them with some cryptocurrency for each transaction — think next-generation Venmo or Paypal. These rewards, called “Pop,” are delivered in Metal’s cryptocurrency MTL and can be immediately converted into dollars, sent to another Metal Pay user or retained as savings. Metal will later link Metal Pay with their equally beautiful micro investing app Crumbs. Crumbs will allow users to turn their spare change into micro investments, like the popular app Acorns, but with cryptocurrency. On the surface, it might seem like cryptocurrencies have reached the mainstream; after all, it’s all anyone can talk about. But in reality, their $200 billion market value is nothing more than a rounding error for big banks. For a true technological payments revolution to take place, cryptocurrency needs to be easy-to-use, easy-to-earn and rewarding for everyday consumers. 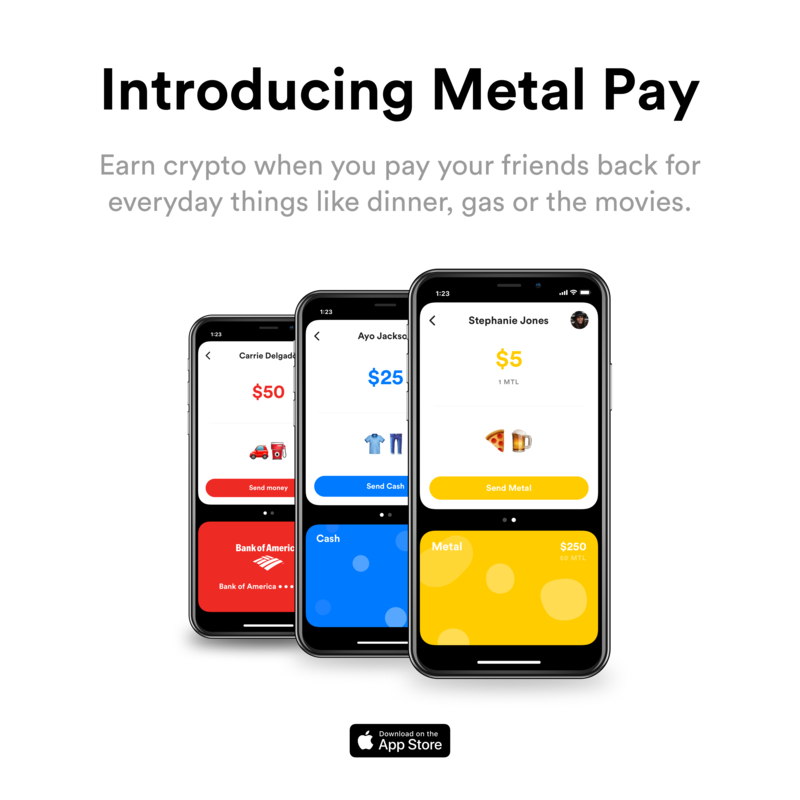 With Metal Pay, Metal has built just that: a simplified payment system — similar to Venmo — that not only builds on the revolutionary ideas behind Bitcoin, but also rewards the people who use and grow the platform with monetary incentives. Our generation coming into adulthood right now has the biggest opportunity of the past 100 years and they don't even know it yet. Together, we can create a world where money works for us, where we don't work for money — that's the vision. Sign up is incredibly simple: just link a bank account to the app, quickly verify identity and phone number, and then begin sending money to people. Payments typically decline or accept in under one minute. Begin earning MTL for every dollar sent or received, for up to five percent of the value of the transactions — just for doing the things people do every day, like shopping, paying rent or getting dinner with friends. There is a game-like element to Metal Pay, where the amount earned is determined by how well someone plays the game. The rules are based on rewarding good financial behavior: the more someone saves, for example, the more they can earn; the more fiscally responsible they are, the more they can earn. Metal Pay is the first cryptocurrency platform that combines traditional bank accounts and a cryptocurrency wallet into one application. The account will eventually have retail banking features such as a debit card and the ability to link credit cards. Metal was founded in 2016 by Marshall Hayner, who previously co-founded Quickcoin and helped build Stellar, Dogecoin and Block.io, and Glenn Marien, who previously developed back-end systems for Bitcoin and other cryptocurrencies. The company has raised $3 million from G2 Ventures, Gateway and Erik Voorhees (CEO of Shapeshift), among others. Vinny Lingham (co-founder of Civic) and Bram Cohen (creator of BitTorrent) are advisors. Marshall Hayner is CEO and co-founder of Metal, a payments processing platform that pays people cryptocurrency for making transactions on the blockchain. Marshall believes that Metal can change the way the world views money. Not only did Marshall start the first Facebook-integrated Bitcoin wallet called QuickCoin in 2014, but he has worked on numerous digital currency projects including Dogecoin, Stellar, Block.io, ChangeTip and the Bitcoin Fair. Marshall is an advocate for social good and has started the Metal Foundation to promote social causes through cryptocurrency.